Advances in Parasitology, Volume 104, the latest in a series first published in 1963, contains comprehensive reviews on all areas of interest in contemporary parasitology. 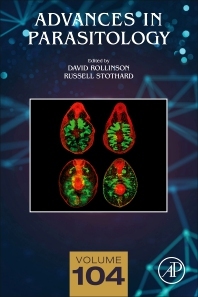 The series includes medical studies of parasites of major influence, along with reviews of more traditional areas, such as zoology, taxonomy, and life history, which help to shape current thinking and applications. This new release includes sections on Leishmania Tropica, Extracellular Vesicles in Host-Parasite Interaction, Cathepsins and Vaccines for Fascioliosis, Echinococcosis Transmission on the Tibetan Plateau, A Review of Diagnostics for STH from a Public Health Perspective, and Zoonotic Transmission of Intestinal Parasites: Implications for Control and Elimination.